We had the first visitors to stay in the Airstream in its new role as occasional guest house. A family of five came down from Vermont on a bargain airfare and four of them inhabited the Airstream for a long weekend. Being in the Airstream as it sits in the dark carport is not nearly as interesting as camping somewhere scenic, but it does have certain advantages for both hosts and guests. I know this because the visit was successful despite four small children. I generally am leery of situations where the children are equal or greater in number than the adults (you never know when they might band together and take over), but these were good kids. Giving them their own space in the Airstream was instrumental to my perception, I’m sure, since they were out of sight and mind late at night and early in the morning. Regardless, a good time was had. In gratitude, they left Emma with the traditional Vermonter’s present: a cold. I don’t have anything against Louisville per se, but I do hate flying this time of year. Flights tend to be crowded, winter storms are always a threat, and if I don’t get a cold from some visiting Vermont child I can be virtually guaranteed of getting one from a sneezing Rhinovirus Ronald on the airplane. Okay, so Portland it is and that costs us another $15 to check the bag. For passengers traveling with large overstuffed roller bags and bulging knapsacks and who carry all this stuff on board, luggage is free! On board there are no services and nothing is free. No free coke, tea. Water costs $2. Flight attendants are now in retail, hawking drinks and snacks at price points ranging from $1 to $7. Do they get bonused on sales? Other than than, they don’t seem to have any duties connected with making us feel comfortable and loved. Oh there is one other duty to perform. In the last 20 minutes of the flight, we’re subject to a commercial announcement, offering us a great deal on the US Air credit card with Bank of America that earns us great freebies on this self-service airline. Who says that credit is tightening? I’m able to obtain it as I’m sitting on a jetliner on its final approach to Charlotte. I long ago gave up expecting anything but basic transportation from the airlines, but things have sunk below even my low expectations. I’m usually content when they just leave me alone, but that is too much to ask on many airlines that insist on bombarding me with loud audio-visual messages hawking their junk. Ever notice how the intrusive announcements always start right when you are drifting off to sleep after takeoff? But what should I expect? Today’s domestic air carriers are what you get when government agencies (TSA, FAA, NTSB) intersect with accountants. Those are the people who really run things now. The pilots and flight attendants are (excuse the pun) just along for the ride. I think a few airlines could do better hiring psychologists and Disney “imagineers” to redesign their procedures and policies. Then they might realize that blaring obnoxious messages above my head, on speakers than cannot be silenced, is what really forms my opinion of the experience of flying their jets. I don’t care if they serve blue chips or pretzels, Coke or Pepsi. I just want to get there with a minimum of fuss and a maximum of relaxation. Leave me alone to read my book. Tell me how to buckle my seatbelt if you really must, but otherwise please sit down. They won’t do that, so I bring an arsenal of counter-annoyance equipment: ear plugs, eye shades, snacks of my own, a distracting book, bottled water. (An airline that offers complete sedation during the flight, like dentists, might be popular someday.) For this trip, maybe I’ll add a surgical mask to the kit in case they seat me next to Ronald. The airline business is just one of many things I don’t understand. 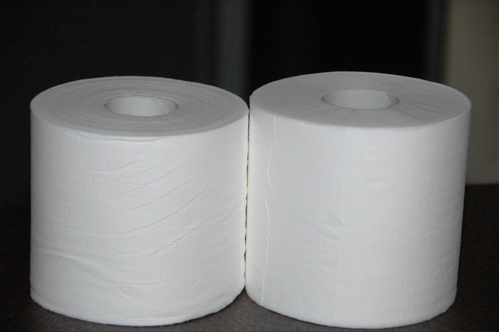 Here’s an example of something that should be dead simple, but isn’t: Toilet paper doesn’t come in a standard roll size. I’m serious. On our big trip to IKEA last month, Eleanor bought a pair of SAGAN toilet paper roll holders. Then she discovered that the Scott’s Single-Ply paper we used successfully for three years in our Airstream (because it dissolves nicely in the black tank, don’t ask how we know) doesn’t fit on the roller. It’s just a tiny bit too wide. But another version of toilet paper fits just fine. This was a clear indication that we needed to Google “toilet paper roll size” and find out the story. Turns out there’s no such thing as a standard toilet paper roll width. It commonly runs from 3.9 inches to 4.5 inches. Buyer beware. This is probably because we’re not as big on standards and regulations in the US as they are in other parts of the world. I’d bet the European Union has very specific guidelines for toilet paper rolls, but here in the US we like to let the free market decide. That’s why wireless LAN technology languished for a decade before manufacturers finally agreed to let their equipment interoperate with other brands. That’s why Europe had, for many years, a far superior cellular phone system (despite the fact that cell phones were invented here). That’s why Alan Greenspan had to eat crow in October. And that’s why we are paying $15 for checked bags and $2 for water after we pay for airline tickets. I like free markets too, but it sure would be nice if my toilet paper fit and my retirement fund was still intact. A few boundaries and guidelines are not necessarily a bad thing. Maybe we could work up one that prohibits hawking credit cards above 10,000 feet, too. So, are y’all planning to adapt the Airstream into a toilet paper storage warehouse? Looks like I’ll need to bring along a credit card (airlines don’t accept cash for goodies purchased onboard)so I can get a drink. Thanks to the airlines for making my decision on purchasing my RV. Who would have thought that no flying was so much fun!! When I was teaching drafting I would tell my kids that except for Burma, (not its name now) the US was the ONLY country that has not adopted the metric system. Poor you, no corporate jet? Ok..I guess I was in a bit of a time warp, but just tuned in after a lengthy absense to discover to my dismay that the one Blog had come to an end. I do think I have a reasonable excuse: 1) My wife and I moved to Europe, and 2) the link to the blog is on a computer that’s never been hooked back up to the net. And since my feeble brain can’t keep track of all the cool sites I used to visit, Tour of America slipped into the craggy recesses of my brain. Glad to see though that you’re still putting up stuff that’s worth reading. Thanks for that. Oh…and at one point when my wife and I were flying home back in October for a visit, I said to her, “Just think, in a few years we might never need to fly anywhere ever again”. I can wait out my 401k losses. But TP that doesn’t fit?? THAT is a freakin’ CRISIS!! !